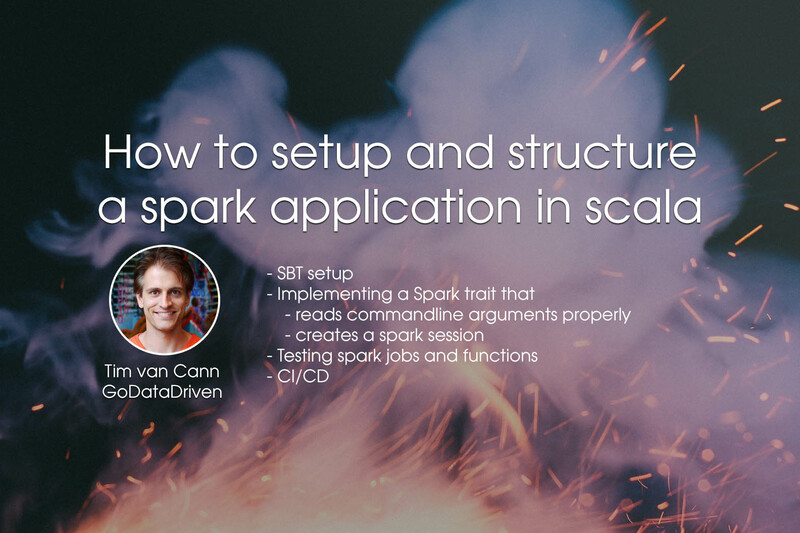 More often than not I notice companies and employees struggling to find a good spark application structure. Code is filled with side-effects, such as mixing I/O with logic, making the spark logic impossible to unit test. They are not using a proper structure that separates concerns destroying all modularity, increasing technical debt. Even though those principles are hard in general, using a computation framework such as spark does not make it easier since each job usually does input -> transform -> output. This post proposes a structure and some best practices that try to address these issues. The first few lines in build.sbt are the most important lines to bootstrap your application. They contain the project name and the spark dependencies. are helpful utility lines that enabled time measurement for each test such that sbt can print those in the testreport. which enables the bash command. Start a SparkSession, initialize a Storage object and call the run function. The only thing actual jobs need to do is implement the functions appName and run. src/main/scala/thw/vancann/UsageConfig.scala is the file containing the UsageConfig case class and the parser that parses the command line arguments. For more information about scopt, please refer to their github page. The src/main/scala/thw/vancann/storage/Storage.scala should define all I/O of your application. There should be no hidden reads and writes, everything should go through one place such that consolidation can be achieved. Note that for this structure we will always assume the use of Datasets typed as proper case classes, as one should. Storage is defined as a trait, this makes it trivial to hook in a different storage implementation for separate use cases or when switching cloud providers, making the code slightly more modular. An actual example sparkjob is provided in src/main/scala/thw/vancann/WordCount.scala. Note that this job seperates I/O from actual logic. The run function reads in all sources needed for this job, this function should have NO LOGIC besides I/O. The magic happens in the transform function, inspired by spark Transformers. Taking one or multiple Datasets plus auxiliary arguments and should transform the data as needed. Returning the resulting Dataset. Anything equal and lower than the transform function SHOULD NOT do any I/O or have side effects in general. This makes it trivial to test all functions without having to rely on external data sources or stubbing databases. Yes, this requires discipline but it'll pay off! Each spark job should only write to one destination and generally do only one thing, i.e. transform and/or combine some data, pull from an API, create a model (using SparkML or H2o, apply a model or do some ingestion. It is fine - and usually necessarily - to read from multiple sources. It is better to have more jobs doing smaller things than a big job doing lots of things! Smaller jobs are easier to test, easier to modify and certainly easier to debug. For testing one usually needs to have a spark session available for each test. To reuse the same session, and to not start a new one for each test class, a SharedSparkSession in src/test/scala/thw/vancann/SharedSparkSession.scala is provided. By importing this singleton into each test the same session is reused throughout tests and suites. An example for such a test is provided in src/test/scala/thw/vancann/WordCountTest.scala using FlatSpec from scalatest as teststyle and test library respectively. Any I/O tests generally go in the src/it folder to separate the unit tests from the integration tests. An integration test that reads a file is provided in src/it/scala/thw/vancann/WordCountTest.scala. Note again the usefulness of the Storage trait as we can easily implement a LocalStorage to read from the resources folder, removing the need for mocking / stubbing. To make sure each push to a branch does not break any code or styleguides Continuous Ingegration (CI) is a good way to catch each culprit and adhere to agreements made by your team. Provided is a way to do CI in gitlab, which allows you to run CI and CD for free as long as you configure your own runner which is quite easy and very well documented here. The file .gitlab-ci.yml describes how to run three stages in a pristine docker container. Run both the unit tests and integration tests and measure the code coverage using scoverage which is added as plugin in project/plugins.sbt. in build.sbt define some settings for scoverage. These particular settings set a coverage level of minimum 70 and let the build fail if coveragereport finds out that the coverage falls below this number. in build.sbt define if and when scalastyle should fail the build. For this last step a few additional parameters need to be uncommented in build.sbt. Have a look at the sbt documentation to see what these lines do. Note that starting each docker container for each stage is quite slow as all sbt dependencies need to be pulled in. A slightly more advanced and significantly faster solution is to prepack a docker image that contains any dependencies defined in build.sbt in the docker image .ivy2 repository folder. A spark job should generally have only one output, restricting the job to do only one thing.